At any event, you should always be on the best-dressed list with your dramatic outfits. Like Araminta's gold jumpsuit, don't be afraid to blur the line between daywear and cocktail, even when edging on extravagance, because there really is no such thing as being too "extra" in this world. With a tasteful eye, you should be able to spot limited editions handbags from a mile away. The iconic Kelly or Birkin by Hermès are a must, of course, and your collection should look like it belongs in a museum with hard-to-find shades and skins, and a good few dozen hard-to-get novelty clutches by Chanel and Louis Vuitton. You need those classics, but one-of-a-kind items are what set you apart from the rest. The sophisticated Eleanor Young (played by just as powerful a woman- Michelle Yeoh who happens to be a Goodwill Ambassador too) is always seen in Carnet, a jewellery brand that originated in Hong Kong, and you'd be wise to follow suit. When it comes to wearing gems like a crazy rich Asian, layer them on, stack them up and never be caught without some serious bling. A stylish woman never lets weather hinder her style. With the launch of the glamorous Coco Neige ski collection from Chanel, you know what you’ll be wearing on your next ski trip, if not Moncler of course. 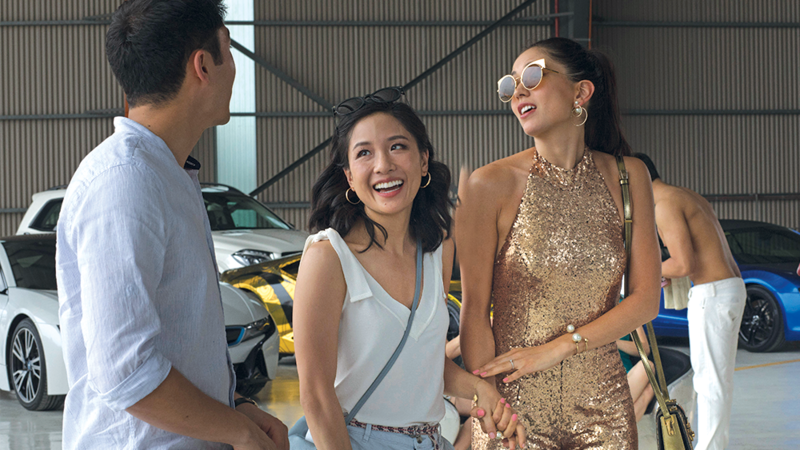 Araminta Lee (played by Sonoya Mizuno) proves that to be a celebrated fashionista in this world, you must look the part from head to toe no matter the occasion. As for activewear, what else would you wear to your Barre or Pilates classes but Fendi? You have top designers on speed dial so you can rock what’s on the runway before it hits the stores. Part of the perks of being best friends with designers, and being favoured as a model by many, is being able to wear a jaw-dropping outfit that include never-before-seen items. As everyone else races to be the first with an LV x Supreme piece, or Off-White x Nike sneakers, you’ve already got your hands on them. Getting your hands on exclusive capsule collection items is easy-peasy, and you’ll be sashaying down the streets with them on before they've even launched. While anyone should be able to master a stylish ensemble, a crazy rich Asian leads by example with an ever evolving wardrobe. Character Astrid Leong-Teo, named the ‘most celebrated fashion icon’ has mastered the talent of curating the best fashion pieces of the season, and she wouldn't be caught dead repeating the same look twice. When you're popping into Paris for the weekend to pick up some designer duds, the only way to haul back all the shopping madness is in a trunk worthy of all your new luxury goods inside—and make sure that trunk is Louis Vuitton, Globetrotters or Moynat. It only makes sense that your clothes travel in style, no? The fairy godmother and friend, Goh Peik Lin (played by rapper and actress Awkwafina) wore silk PJs by Stella McCartney and we're all for it. Always in a quirky animal print or playful stripes to highlight the comedic attributes of her character, she's a welcome reminder that fashion should always be fun. Take it from the bride-to-be, Araminta Lee–your wedding gown must be custom-made. As a muse to the stars, Araminta’s wedding gown was designed by none other than Garavani Valentino himself. After all, she is sartorial icon. Many fans have already seen the exquisite and tear-jerking snapshot of Araminta gliding down the aisle, and though you will undeniably be the showstopper of the night, don’t forget some designer-wear for your bridesmaids too.